Our focus is to insure water quality by utilizing the area’s abundance of rainfall. This water will not make contact with the ground; therefore, eliminating pesticides, herbicides, iron, calcium, magnesium, heavy metals and other substances. Interested? 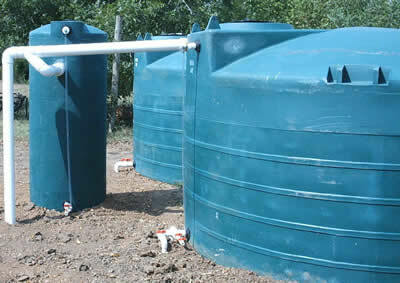 Fill out this form to receive a free quote for a rainwater system for you home or land. You will be in control of your water supply at all times. Instead of adding chlorine, the natural U.V. light will act as a disinfectant. Fluoride is ideal in mouthwash and toothpaste but certainly not intended as a part of drinking water! For you to use during municipal down times or the occasional accidental contamination periods, we will install a large storage vessel for your reliance. This leaves municipal water supply as a back-up. By rainwater not having calcium or magnesium this eliminates the worry of prematurely replacing appliances such as the water heater, dishwasher, ice maker, and plumbing fixtures due to erosion. 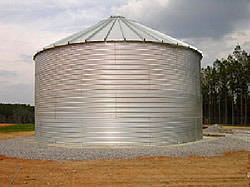 The water filled storage tanks serve as fire protection, and could help lower insurance premiums by a great deal. (Check with you agent.) The amperage load for the pumping system calculates a much lower cost per gallon of water delivered as compared to municipal supplier charges. The rate of a supplier is likely to increase periodically. In the event of a power failure, a small generator will run the pump to keep in pressurized water. 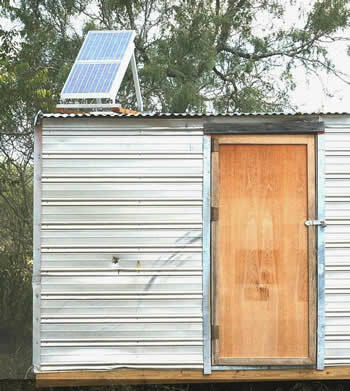 You can be off the grid! HOW MUCH CATCHMENT AREA DO I NEED? WHAT ABOUT LOW OR NO RAIN PERIODS? You will have no doubt of water availability in the future (approximate annual rainfall of 32 inches per year in the Central Texas region). In the past, land owners have spent thousands of dollars only to find a malfunctioning well due to lack of water. You will have a known and consistent quality of water. You will never have to pay for a service truck to pull a pump out of a well and replace it. The cost can be over $2,000.00 and nation wide the life of the pump is only five to seven years. 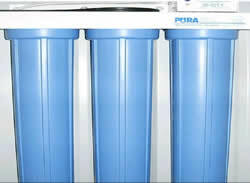 The needed water treating system is included in the price. (no surprises after installation). Initial cost of installation is comparable. Much lower recurring maintenance costs. Much lower cost of elec. Power to operate. Some counties now offer $100.00 rebate on property development fees. Hays county was among the first to provide a Rainwater Collection Incentive Program including tax exemption of 100% of the cost. These fiberglass tanks are the best value because they are custom-built to order with all the fittings needed for one’s particular application. (most all are different) Unlike poly tanks, no special adaptation is necessary. 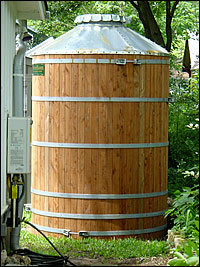 If fiberglass tanks become damaged, they are easily repaired; the same cannot be said for poly or concrete. Also are very nonporous and leave no taste residue in your water. They are coated with a U.V. inhibitor and are available in many colors. 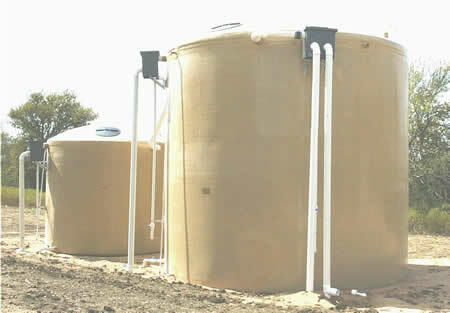 Some fiberglass tanks installed on a barn in Copeland. 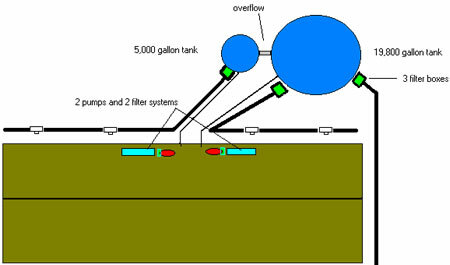 Complete system with generator backup for pump. 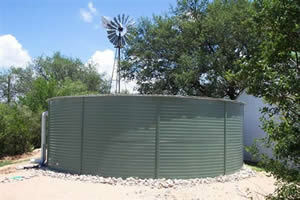 This is one or our many tanks and can be used for rainwater harvesting, wells, irrigation or other applications. 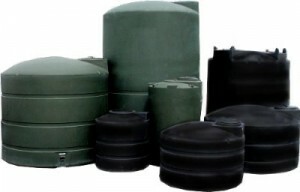 Storage Tanks from Snyder Industries These are the poly tanks we use for all applications. They are the very best poly tanks in the industry. These tanks are heavily pigmented to deter algae growth. The tanks come pre-fitted with a heavy-duty bolted bottom drain fitting and a top fitting located near the manway for tank float accessories. They come standard with large manway openings for easy tank cleaning and inspection and carry a three year warranty. The first example is a very large system using the very best of everything that we offer. Location is near Garfield off hwy 71 and Wolf Lane. It was designed large enough to provide water for both a large shop with live-in apartment and a sizeable home with pool and Jacuzzi tub. It is really two systems in one. 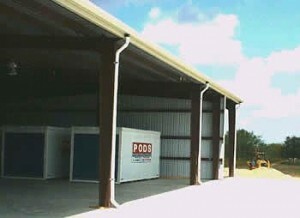 The shop and apartment was 185’ by 45’, over 8,000 square feet of catchments area. The downspouts shown are 3” pipe. Because there were a number of them, we had to bury a 6” trunk line around the front of the building to the rear for delivery to the tanks. We dedicated about 75% of the roof area to the first tank holding nearly 20,000 gallons of water. This water is to be delivered to the home site just about 100 feet away from the shop area. The remaining roof space goes into the smaller tank holding 5,000 gallons, and is for the apartment and shop use. The roof washer allows the water to enter low in the box and then rises up through a screen. It then empties into the tank. The screen catches such things as leaves, bugs, and other debris that can accumulate between rain showers. These things are periodically drained away through a 1 ½ “ flow line out the bottom of the box. Once in the tank, the water does not become stagnant over time because no light is allowed to penetrate at any point. Bacteria cannot colonize and grow without light. 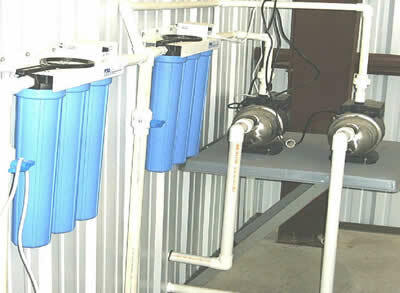 Our filter system is a small rack of very effective equipment. This makes a much cleaner install than a wall or floor full of individual separate components. First is a 5 micron sediment filter, then carbon to remove organics and improve taste, and last if Ultra Violet light for disinfection. 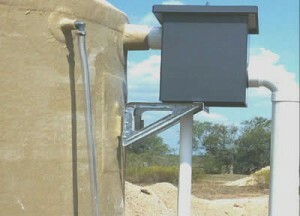 The cost of purchasing and maintaining this equipment if fractional in comparison to a submersible water well pump and the massive treating systems usually needed. Our customer had a desire to be totally off the grid for delivery of her water to her home. 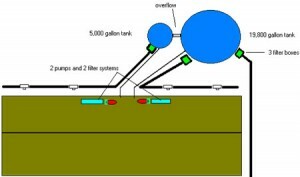 It is a relatively inexpensive installation using two 5,000 gallon poly tanks and a first rinse roof washer just made of a smaller tank that she partially drains after or before an episode. Then she pumps the water to the home using a solar powered pump through the same filter system that we usually use. Pretty Cool! 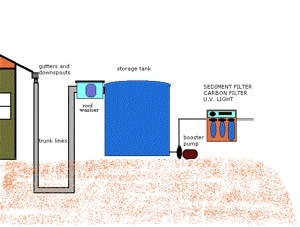 The first vertical tank catches the very first water off the roof and when it fills to the point where the water enters then water flows to the holding tanks free of leaves and other debris. The customer occasionally drains a determined amount of water out of the primary tank and it is ready for the next shower The two large holding tanks are joined with 2” plumbing at the bottom so that they keep the same level of water in both at all times. The solar pump is tucked away in the previously existing shed along with a small pressure tank. There are also included two batteries kept charged by the p.v. panel so that water can be used in the evening and early morning for showers and cooking etc. This customer does not depend on the local rural water supplier nor the rural power company for delivery of her water! She is completely in control of her water quality and availability.